Today I finally got the official tour of the park. The guide actually showed up, and gave the excuse that she’d come by but had found me sleeping and had wanted to leave me alone. Hmmm…how considerate (if it wasn’t complete bull that is). Of course taking into consideration that we were running on Madagascar time, an odd time bubble that fluctuates, sometimes being an hour early or an hour later, perhaps she was telling the truth…Whatever her excuse she was there now, and so we headed into the park. “So what are you interested in?” she asked. “Reptiles, Amphibians, insects, basically anything that I can get close enough to touch”. These words didn’t seem to penetrate. “Lemurs?” “Ummm…not so much”. “So not lemurs?” Language barrier? We were both speaking French, I couldn’t put my finger on the problem. “No, not lemurs” I repeated. “Okay”. Ranomafana national park is a little unique in that it employs “rabbateurs”, typically young men who run around looking for animals that tourists are likely to find interesting. When they find something they give whooping calls to bring in the guides. Listening to the lemur calls and the echo from the rabbateurs, one was truly drawn to the similarities between us and our simian brethren. 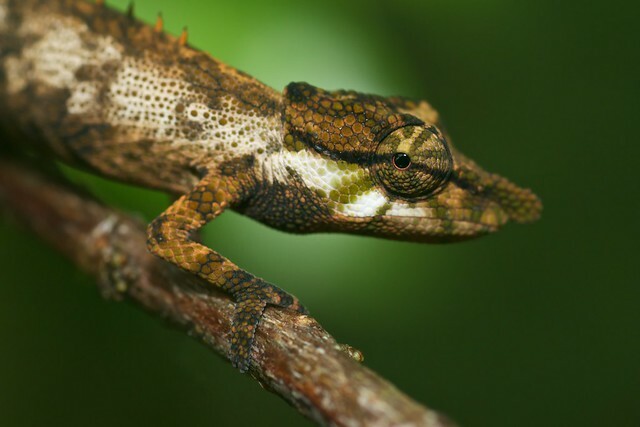 The day started well, right off the bat we saw a chameleon, Calumma nasutum. We had hardly gone 100m when we saw a satanic leaf-tailed gecko (Uroplatys phantasticus). One has but to look into the blood shot eyes and horn-rimmed eyes to understand how this fantastic little gecko earned its namesake. 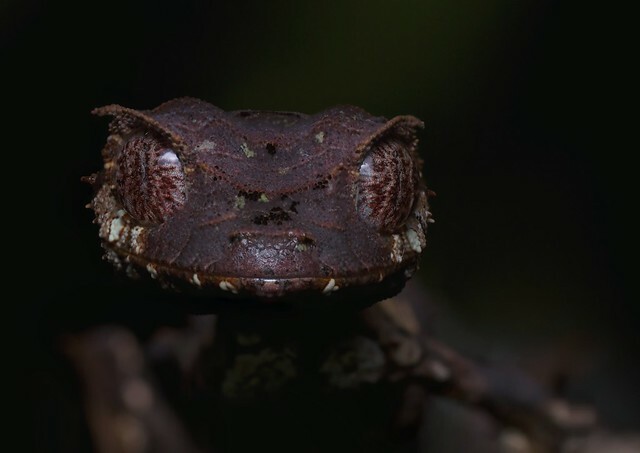 Satanic leaf tailed gecko (Uroplatys phantasticus). 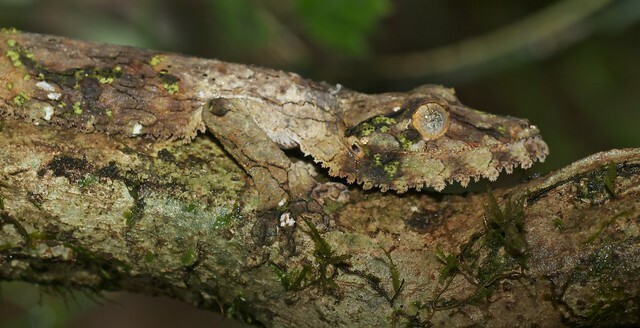 This Leaf-tailed gecko appeared thto be e most common since I found 3 in the 2 weeks that I spent in Ranomafana. They range in colour from the purple seen here to beige and brown. They are most typically found on dead branches where their leaf-like appearance is used to the greatest effect. Found during a night hike in Ranomafana national park, Madagascar. Again, another 100m and we saw another leaf-tailed gecko (Uroplatys fimbriatus), this one even more impressive than the last. Probably the most impressive of its genus, this gecko has huge flaps of skin under its chin, and around its sides. These flaps are also equipped with tiny flanges that lie flat against the bark. The result is that the scales, a patchwork of mould, fungus, bark, and lichen melts seamlessly into its surroundings. Needless to say this was proving a biologist, and a photographer’s paradise! Well, more the former rather than the latter I quickly discovered, as I was bumped and jostled out of position by an incoming horde of tourists. We moved slower than the larger groups of 5-10 tourists, since it was just me and the guide, but even so, the whoop of the rabbateurs drew us ineluctably forward. “So”, the guide said with a flourish as though presenting the crown jewels of the rainforest “the sifaka”. “A lemur”, I said with a deadpan look that did nothing to quell her enthusiasm. “Yes!” She was excited, I’ll give her that. But as she and the other tourists ran about confusedly through the trees, running here and then there, confusing the calls of the rabbateurs with those of the lemurs, I looked calmly at the leaves and tree trunks around me and continued to photograph the insects. It felt like in the chaos, I was in the eye of the storm. Finally, a little peace! When the hullabaloo had died down, the guide returned breathless. “The lemurs have gone that way” she signalled, fully expecting me to follow the trail churned by the tourist traffic. “I think we should go that way” I said, purposefully pointing in the opposite direction. I didn’t know where it lead, but I was sure it was away from everyone else at least. The guide looked slightly disappointed but readily acquiesced. The day passed quietly, the occasional insect or frog, but nothing like the morning’s insanity which in all honesty didn’t give one enough time to fully appreciated each animal’s incredibly biology. 4 o’clock rolled around and it was time to head out. The tourists were funnelled onto the main trail, ushered out by the guides. Park’s closed, see ya tomorrow! Nb. I should add a sidebar to my actions which may strike some, especially those in positions of authority as flouting the rules and behaving irresponsibly. I do as I do due to the stubborn intransigence of an organization bent on following the letter, rather than the spirit of conservation biology (notwithstanding the gross incidences of government sanctioned transgressions eg. the sale of illegally logged rosewood). If they had a simple streamlined process that wasn’t mired in red tape and bureaucracy I would gladly step in line. However, the system is clearly broken and following the rules of a broken system will not lead you where you want to go.